The world is fairly football-crazy, yet this sport is not always easy to understand. 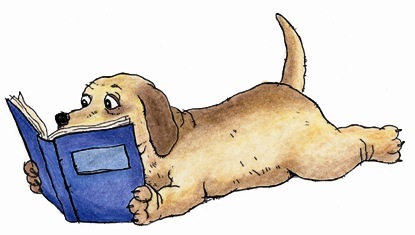 It is full of mysterious starts and stops, twists and turns, and punts and kicks that enthusiasts aren’t always able to explain to newbies in plain English. And if it’s not so easy for adults to understand, it’s probably even more difficult—and daunting—for little guys to understand, right? Wrong! 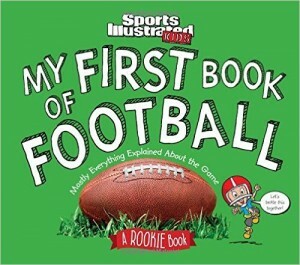 Sports Illustrated Kids has taken care of this challenge by creating a very clever “Rookie Book” sports series that explains the rules and regulations of different sports. 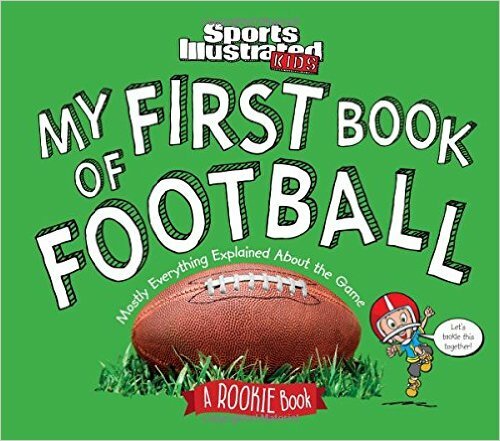 Its latest series installment is a clever and adorably packaged book called My First Book of Football: Mostly Everything Explained About the Game, and it’s sure to make everything clear to young sports enthusiasts. In My First Book of Football, photos of actual football players adorn every page. The players are captured engaging in everything from the coin toss and the kick off to tackling each other and huddling for a new strategy. There are photos of players crouched down and giving each other the stink eye as they prepare for the next play; players sprinting across the field as they block the bad guys (a.k.a., the other team); and even players doing the end zone dance. What makes these photos unique is not that they were captured on the field as the players are in motion, or that the pictures are brimming with color (deep greens, eye-popping oranges, lush purples, and the like). It’s that each photo is explained by a little guy in an over-sized football helmet who struggles to understand what’s going on as he keeps up with the game. He learns to count “downs” and understand passes, interference, and field goals. When the concept of “half-time” is introduced, he learns what people do during that time—namely, eat a snack, stretch their legs, and take a bathroom break. And true to toddler form, once the thought of a snack is introduced, the mascot can’t think of anything else except chowing down. This book is highly recommended for junior sports teams, early elementary classes, and personal libraries.